Last Friday finished off my first full week of work since my surgery. I was still on crutches full-time, and anyone who has been had to use crutches knows how exhausting they are. So, that combined with my hip still hurting and the general fatigue that everyone feels by the end of a work week made me relieved to walk in the door of the condo and know that Hubby and I had no plans for the weekend. Don’t get me wrong, it had been a week and I was happy to start getting back into the swing of things, but it also takes a lot of energy. In fact it wasn’t until Friday that my boss actually commented on how I was started to look like I was feeling better. I figured that, along with surviving my first week back, was something to celebrate. So, I grabbed a bottle of bubbly that I brought home with me from my February trip to Napa and settled into an evening of unwinding with Hubby. 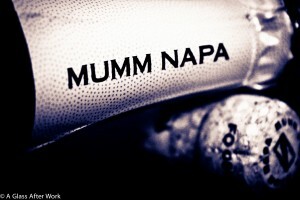 The Mumm Napa Brut Rosé (winery, amazon ) was a pale-to-medium cotton candy pink with lots of small, persistent bubbles. The sparkler is made in Napa Valley, California and is a blend of Pinot Noir and Chardonnay grapes. On the nose, there were cherries, strawberries, and hints of whipped cream. In the mouth, there were cherries, strawberries, and plums mixed with the slightest hint of yeast and cream. The sparkler had a light body and bright acidity. Is this worth a glass after work? Definitely! If you see this wine in the store, grab it; you won’t be disappointed. At $24, this bubbly is perfect for a Friday night indulgence without being so much of a splurge that it hurts the wallet, and it was what I was looking for at the end of a long (although positive) week of work. I sipped on my first glass while I was on the couch. Hubby and I were catching up on our respective days as he pan-fried some tilapia and sautéed fresh spinach in garlic and olive oil for dinner. My second glass was with dinner, and the bubbly made a nice pairing because the acidity of the sparkler helped cut through the oil in the fish and the spinach. Afterwards, I poured myself another glass before stretching out on the bed to watch a movie and ice my hip. 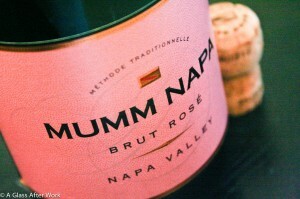 The bubbly was refreshing and enjoyable in its own right and carried me through a quiet and relaxing evening. Question of the Day: Are you a sparkling wine fan? Do you have a favorite?